As I was rummaging through some tomatoes at a small stand, one of the workers started to tell me about how the tomatoes I was eying were delicious baked with zucchini and onions, seasoned with oregano, and topped with fresh mozzarella. He continued to detail the recipe for this dish, but I was already sold. Since zucchini season was winding down and I had yet to cook anything with the green squash this summer, I happily purchased a very thick zucchini along with my tomatoes. When I made the casserole I really liked how it highlighted the fresh and flavorful vegetables that were in season. I think it would loose its charm if you used out-of-season veggies. 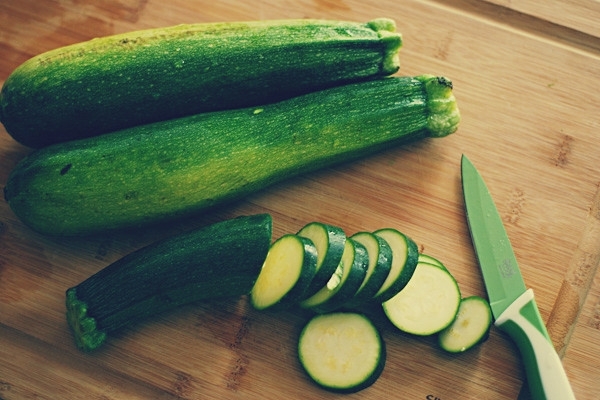 However, it can be a year-round dish if you substitute whatever is in season for the zucchini and tomatoes. You can also have fun with the dish by spicing it up with whatever spices you like–next time I might try some basil, parsley, or paprika. Despite previous road bumps, I have high hopes for similar biking ventures to the farmers’ market and have set a few (lofty) biking goals for the next month. 1. Learn how to change gears. Unlike my middle-school mountain bike, my new bike doesn’t have a self-explanatory switch on the handlebars. 2. Find a fence and lock bike in less then 2 minutes. You might think parking for a car is hard to find in Lincoln Park, trying finding a post to park your bike at in Logan Square. 3. Bike to the farmers market every Sunday. 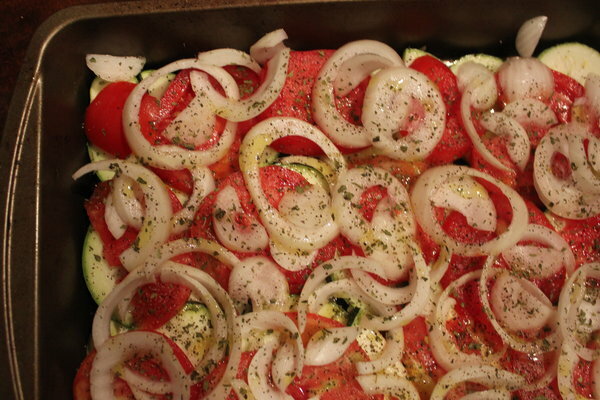 Cover the bottom of a baking pan with a layer zucchini, then tomatoes, and finally onions. Sprinkle with additional olive oil and season with oregano, salt and pepper. Bake for 35 minutes. Take out of oven and cover with slices of mozzarella. Bake 10 minutes, or until the mozzarella begins to brown.